2018 saw big changes in the energy industry in the UK, as the switch to renewables sky rockets, sales of electric vehicles soar and the number of jobs rises again. With so much uncertainty in the UK’s immediate and near future, one thing is certain no matter the political landscape – a career within the energy sector is a great place to be. In 2018 UK energy generation was it’s lowest in over 20 years, as demand continues to fall from homes and businesses. Per-capita, electricity demand has fallen by 24% since 2005 when energy use peaked. Since 2005 the UK population has increased by 10%, but demand has fallen by 16% - representing the difference made by energy efficient appliances, changing behaviours and better insulation and construction standards. A third of electricity was supplied by renewable energy in 2018, as wind power continues to surge in prominence – providing 58TWh of the mix, a rise of 16.4% against 2017 and 105% more than five years ago in 2013. Lowest electricity generation since 1994 - 335TWh in 2018 against a peak of 398TWh in 2005, a 16% reduction. This reduction is equivalent to 2.5 times the output of the new nuclear plant at Hinkley. Since 2005 population has increased by 10% from 60 to 66 million. Per-capita electricity generation has fallen by 24% since 2005, the lowest level since 1984. Whilst electricity demand continued its downward trend last year, it looks set to or level off as the shift towards electric vehicles (EVs) and away from petrol- or diesel-powered vehicles accelerates. Record numbers of EVs were sold in 2018, more than 60,000 new vehicles were registered last year, bringing the UK total of EVs on the road to 210,000. 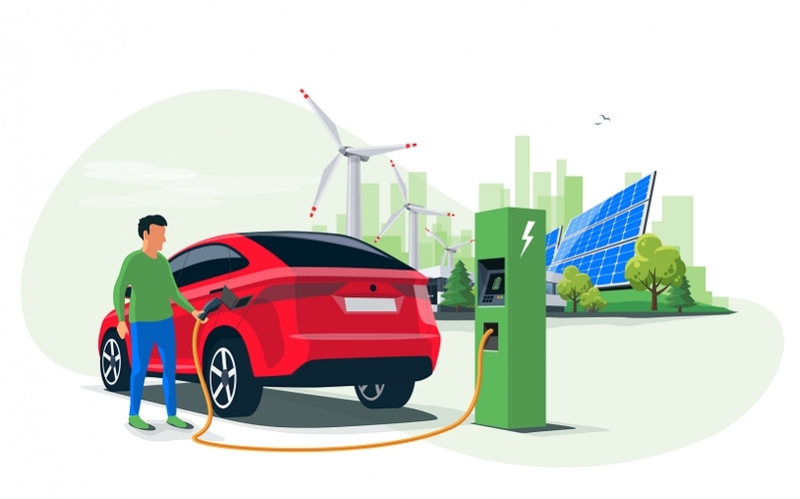 The latest figures from The National Grid predicts a tremendous growth in EVs, their latest report estimates 10million EVs to be on the road by 2030, 25m by 2035 and 35m by 2040. The same report in 2017 predicted numbers half this size, representing the rapid changes in customer and market growth. More than 60,000 EVs registered in 2018, bringing total to 210,000. 5,000 public charging points added in 2018, bringing total to nearly 19,000 at more than 6,000 locations. In their 2018 report, The National Grid expects 10 million EVs to be on the road in the next 10 years, (by 2030) and 35m by 2040 – doubling their estimate from 2017. As reported above, energy consumption from wind rose to 17.4% of the mix last year and the UK now has the highest installed capacity of offshore wind than any other country in the world. The UK’s capacity is set to snowball in the coming years, with current capacity at 6.4GW and 8.1GW under construction and a further 20.6GW consented to bring the UK to 35GW by 2032. This incredible growth means a huge demand for skilled workers. A report by the Energy and Utility Skills group predicts the number of jobs to triple between 2018 and 2032, with jobs needed at all levels and all across the UK. Workforce demand across the energy and infrastructure sectors is predicted to include 160,000 new jobs and 600,000 jobs needing filling due to retirements by 2024. In 2018 6.4GW in operation, 8.1GW under construction, 8.5GW consented but not yet constructed, 12.1GW pre-consented. This increases the installed capacity from 6.4GW in 2017 to 35GW by 2032. The number of people employed in offshore wind is predicted to rise from 10,000 to 36,000 by 2032. The number of wind turbines will more than triple, from 1,660 to more than 5,000. The average capacity of wind turbines in 2017 was 4MW, 7MW in 2018, in 2020 pre-consented projects have average capacity of 10MW and in the mid-2020s average turbine power could be 13-15MW. Are you looking for a new job in the energy industry? Our specialist team work with local, national and international companies with exciting positions in all areas of the renewable, oil and gas and nuclear industries. Give our office a call on +44 (0) 1502 564892 or email us at cvs@peoplewithenergy.co.uk.